When I first walked into Smack Mellon Gallery in Dumbo last Thursday night, for its Press Play Series I saw a wall. For a second, I wondered if I had gotten the date wrong. I wondered if the gallery was still working on the installation. The bisected cavernous space looked completely different. And of course that was the point. I was looking at, confronted by Blane De St. Croix’s installation, Broken Landscape. It is an almost literal rendering of the Mexico/US border, over eighty feet in length, in the main gallery space— but monumentally miniaturized. The wall itself is chest high, perhaps a foot wide. 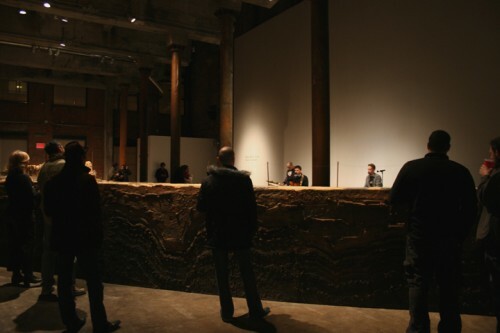 Reaching down from wall, as if a giant knife has sliced through the earth, the piece reveals the underlying geological stratum as neatly and as scientifically as a textbook. The terrain is haunted. It is devoid of human habitation. The border is a ghost town. On the one hand, it is an intimate portrait of the unfriendly, almost menacing topography of this region, and on the other, a charged political statement. The end of the wall is a bisected overpass of a highway that begins and ends in mid-air. In contrast, the beginning of the border resembles the badlands, an almost primeval landscape. It eventually evolves into civilization, the floating highway— yet both look dangerous.